I was sad to see how empty the restaurant was. Granted, we were there on a Monday night, and most people probably have a case of the Mondays, so they don’t want to hassle with a real dinner out and would rather hit a drive through and get home to watch the crazies on The Bachelor. Ladies, am I right? Do you feel totally confident, sane and datable when you watch The Bachelor? Oh, I’m the only one who watches. Hm. OK. Note to self: Don’t speak of in public. However, that said, we had really great service. And the food was excellent! I, of course, ordered the bi bim bab. 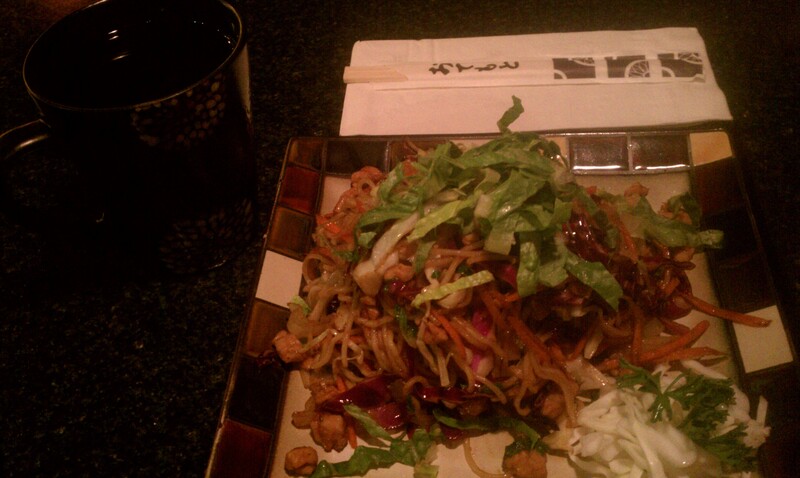 And Lyndsey ordered the chicken yakisoba (noodles stir fried with meat and veggies). That was HER picture listed before the jump. And it looked delicious. She said it was delicious. So we’ll go ahead and pound the gavel on that consensus. Both of our meals came with soup or salad. I opted for the miso soup. Lyndsey went with the salad. A good dinner was had by all. Funny side note, when the waitress brought out my bi bim bab, she said it like Vanilla Ice says “beeb-em-bob-em” in “Havin’ a Roni.” Of course, that means that song’s been stuck in my head since she said it. Well, that and the “Two turntables and a microphone” song. They take turns. It’s like one’s opening for the other. But they both think they’re the headliner. Anyway, for your listening pleasure, and oldie and a goodie. Somewhere in the middle of Nowhere, America, Rob VanWinkle is cringing that I’m posting this video. Rather than link you up to a video with an ad (my current Internet pet peeve), I’m liking you to a video some kids made because it makes me laugh (opposite of cringing at ads). Don’t read the comments if you don’t like creepy pedophilia at work. Ew. 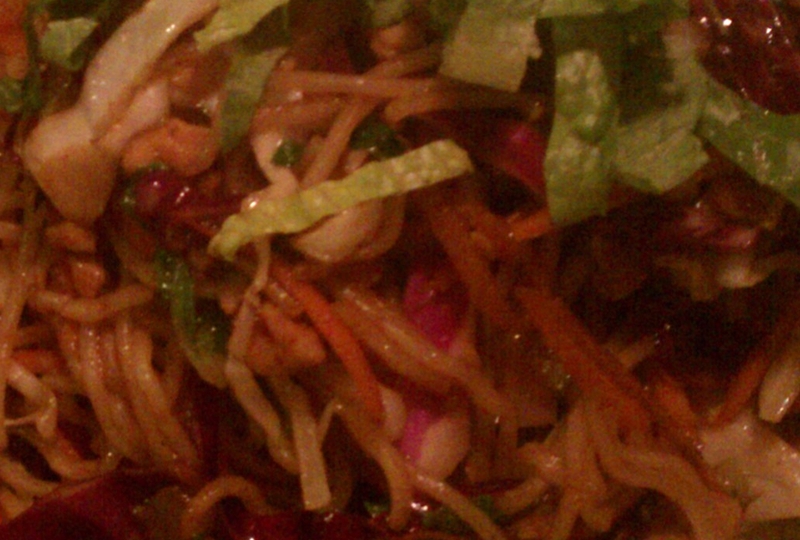 Here’s a zoomed out shot of the yakisoba noodles. I know, right? Let’s meet up and order THAT! 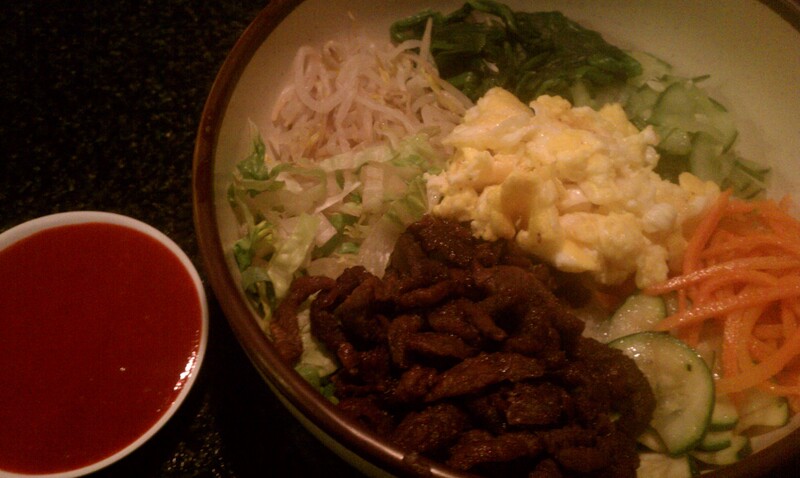 And at long-last the bi bim bab. Pre-bi bim bab and soy sauced. And prior to the big stir. Um YES. I can’t wait till our next eating outing! That sounds dirty but it isn’t.